Last updated Monday, Feb. 25, 2019, at 11:56 a.m. This article describes how to plan and validate your schedule, and enroll in classes through the MyBlugold CampS website. In MyBlugold CampS, you register from the Student Center. The process resembles online shopping. 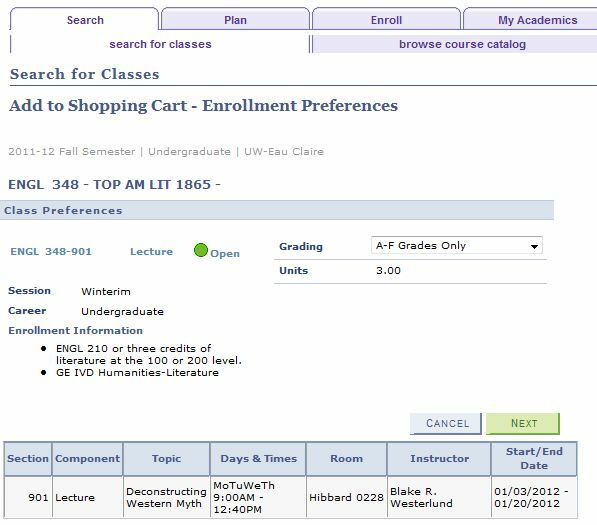 You search for the classes you want, plan your schedule by placing classes in your Shopping Cart, validate your classes, and enroll in them. 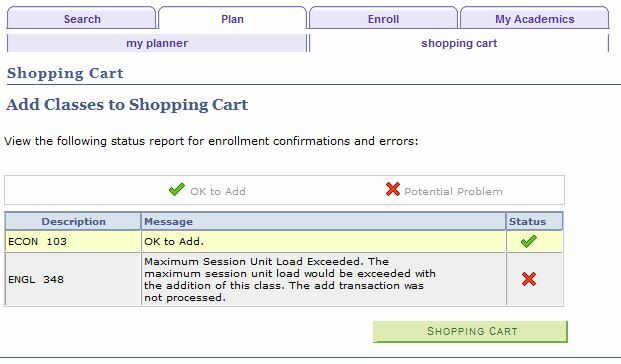 NOTE: The initial planning stage, where you place classes in your Shopping Cart, can be done prior to your registering appointment time. The actual enrollment, however, will not be accessible until your appointment time has been reached. Planning your schedule allows you to place desired classes in your Shopping Cart. You may add more classes to your Shopping Cart than you plan to enroll in. 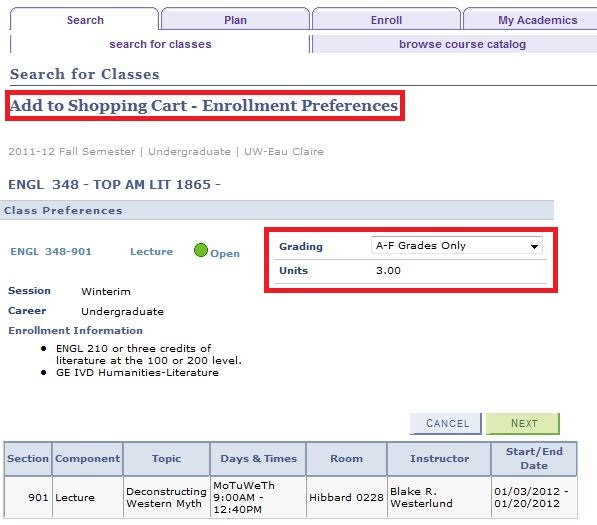 You will select the classes for enrollment from those in your Shopping Cart. WARNING: Remember that the Shopping Cart is only a staging area; you will not automatically be enrolled in these classes. It is also not a waiting list, and does not give you any priority for a class that may be filled. Access the MyBlugold CampS Student Center. Check the Enrollment Dates section on the right for your Shopping Cart Appointment and your Enrollment Appointment. NOTE: The Shopping Cart Appointment is the date that you will be able to start planning your schedule and placing classes in your Shopping Cart. If you have reached the Shopping Cart date on this page, you can proceed with planning your schedule. In the Enrollment Dates section, select Details. The Enrollment Dates page appears. Enrollment dates for the selected term appear. In the Menu, select Student Center. The Student Center page reappears. NOTES: These instructions guide students through searching the class schedule to fill the Shopping Cart. With the availability of the Planner, you may want to use a combination of methods. 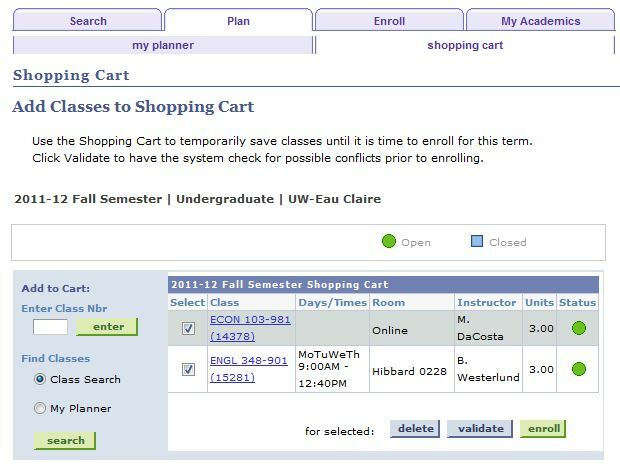 See Using the MyBlugold CampS Planner for information on filling your Shopping Cart from the Planner. In the Academics area, click Search. The Search for Classes page appears. HINT: The Institution should be UW-Eau Claire. HINT: It should be the semester for which you are choosing courses. In the Class Search Criteria section, enter your search criteria. Click Search. The Search Results web page appears. NOTES: For more information on searching for classes, refer to Searching the Class Schedule. If your search criteria were too broad or too narrow, you may receive an error message. Change your criteria and try again. For more information about a course, click the section link. The Class Detail page appears. To place a class in your Shopping Cart, click View Search Results. To the right side of the desired section, click Select Class. The Enrollment Preferences page appears. NOTE: For a class with a lecture and a lab, you can choose either the desired lab or class first. You will be prompted to choose the other component. 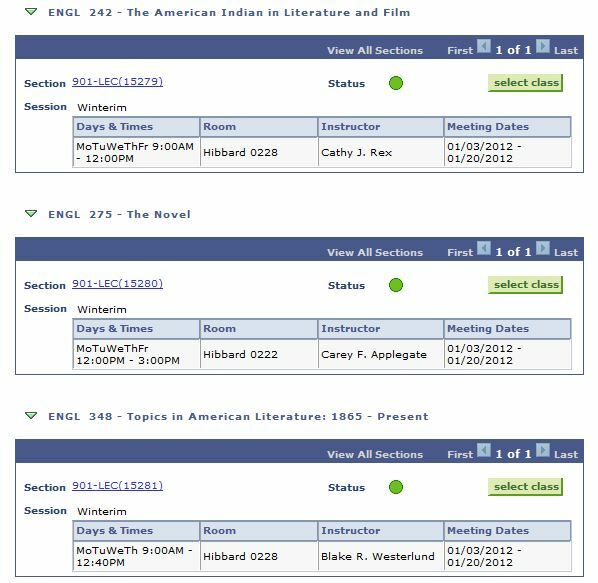 Verify the class information, including meeting times and enrollment requirements, and check to make sure that the class is marked with a green circle which indicates that the class is open. (Optional) From the Grading pull-down menu, select your desired grading basis. (Optional) If this is a class with a variable amount of credits, from the Units pull-down menu, select the desired number of credits. The Search Results page appears. The class has been added to your Shopping Cart. Click Start a New Search to add more classes to your Shopping Cart. Repeat steps 7-15 for each class you want to put in your Shopping Cart. 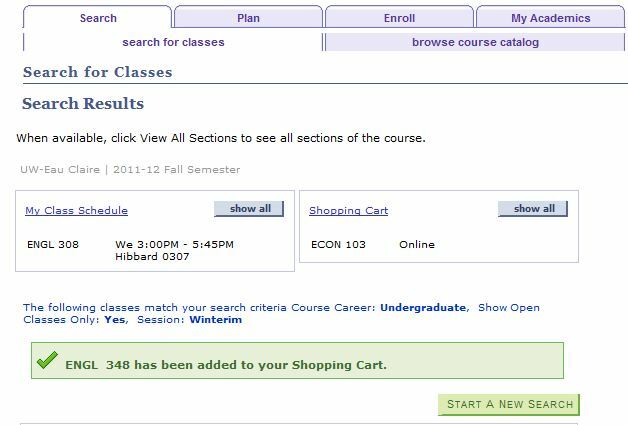 When adding a course to your shopping cart in the Enrollment Preferences step, you may be given the option to change your grading and/or credit options. The Grading dropdown (if available) will usually default to A-F Grades Only. By clicking the dropdown, you may select Converted S/U. By opting for A-F Grades Only, your course will be graded based on the letter grade system that ranges A through F. By opting for Converted S/U, your course grade letter grade will be converted to Satisfactory or Unsatisfactory. Any grade earned at a “C” or higher will convert to Satisfactory, and any grade earned at a “C minus” or lower will convert to Unsatisfactory. An Unsatisfactory grade will not be computed in your semester or resident GPA, and you will not receive credits for the course. You may decide to register a course as S/U if you know it will be difficult for you, and don’t want a low grade to affect your GPA. However, keep in mind that there are restrictions and conditions attached to registering a class as S/U. Look at the Satisfactory/Unsatisfactory Policy before deciding to change the grading option. Most classes offer a set amount of credits, but some classes, such as internships and other similarly flexible courses, will offer a range of available credits to choose from. You may need to discuss with your professor and/or advisor to decide how many credits you should select for such courses. If you wish to change the grading or units option for a class after you have enrolled in it, you may do so through the MyBlugold CampS website. Select the desired class from the drop down. Select the desired grading and/or units option(s). Review the changes and click Finish Editing. Validating your classes assures that you will be able to enroll in them without any conflicts, for example, a prerequisite that was overlooked. The Student Center page appears. In the Academics area, click Plan. Click the Shopping Cart tab. HINT: The Planner is used for planning courses for multiple terms. The Shopping Cart is used for planning classes (which have a section, meeting time, etc.) for a particular term. Select the classes you want to validate. NOTE: An option is selected when a checkmark appears in the Select column. The Add Classes to Shopping Cart page appears. NOTE: In the Status section if a checkmark appears, this indicates a valid class, ready for enrolling. If an "X" appears, the system detected a potential conflict. For example, you may need the instructor's consent or to clear a hold. In the Message section, you will receive further information about the conflict. HINT: Read the Message section. Even if a checkmark appears, there may be holds that are not considered potential problems. Enrolling in classes will formally allow you to register, adding your name on each of the class lists. In the Holds section, check to see what, if any, holds are preventing you from registering. In the Enrollment Dates section, check your Enrollment Appointment date. NOTE: This is the date that you will be able to start registering for your classes. If you have reached the date on this page, you can proceed with registering. In the Academics section, click Enter PAC Code. The PAC Code Entry page appears. NOTE: Students only need to enter a PAC Code given by their advisor if they have less than 60 credits earned or if they are in a program from a college that requires it. In the Code entry box, enter your assigned PAC code. Click Submit Code. NOTE: If you do not know your code, you may obtain it from your academic advisor. The Enrollment page appears. Check the classes in your Shopping Cart, including their statuses. NOTE: You may add classes to your Shopping Cart at this time. In the Shopping Cart section, click Proceed to Step 2 of 3. The Confirm Classes page appears. Make sure that all your classes are still open. NOTE: If not, use the steps in Plan Your Schedule to look for other open sections. The View Results page appears. NOTES: This is an important step to make sure that your schedule is accurate. In the Status section of a particular class, if a checkmark appears, you have successfully enrolled in it. If an "X" appears, you have not enrolled in the class. In the Message section, you will receive further instructions.